Meet for practice each Thursday evening from 7:00 to 8:30; new ringers always welcome. Archbishop Whiteside blessed the bells at St Joseph’s on the 29 October 1911. The heaviest bell weighs 10cwt 2qtr 6lbs. They were inscribed and donated by the following benefactors. The bells at St. Joseph’s could fall silent unless we can maintain a regular band of ringers. At the moment we have about 6/7 regular ringers, and most Sunday’s we have to rely on the support of visiting ringers from other local towers. We are always on the look out for new recruits and if you are interested to try it out then contact the tower captain. St Joseph’s has a fine set of 8 bells and a lively sociable band of people to ring them. However, we need to begin teaching new people, to ensure the bells keep ringing in the future. Learning to ring bells is not difficult but does require plenty of practice. It takes about six months to a year to learn to control a bell properly. Anyone from teenage upwards can learn to ring and will soon discover there is much more enjoyment and skill to it that just pulling a rope. There is always something new, interesting and challenging to learn as well as enjoying the good team spirit that develops through shared activity. We are known to be quite a sociable bunch too! If you are able to climb the stairs to the ringing room, you should be fit enough to learn to ring a bell. Visit the belfry without obligation. Information and tuition will be provided on Tuesday evenings from 7.00-8.30. Please contact the Tower Captain, Richard Jones, to arrange a visit and practical session. Practice night ringing at St Joseph’s is Thursday 7.00-8.30pm. 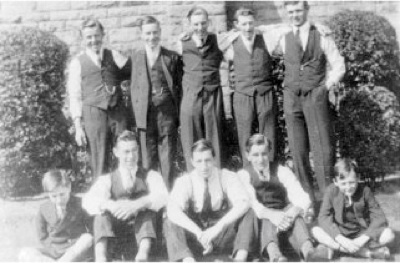 Back row left to right: Tom Gillett, Harold Cross, George Cross, John Gillett, Jack Nickson. Back row from left to right: Richard Cross-tower captain, Richard Jones, Paul Barton, Grahame Evans, Bob Totten. Initial teaching takes place on a one to one basis and most learners will be ready to ring with a band in a few weeks or months. There is always something new to learn and ringers progress at their own pace, depending on the time and effort devoted to increasing their knowledge. The skill lies in being able to control the bell that rotates full circle using a rope attached to a wheel. Bell ringing can take up as much or as little time as you can fit in. Some learners to bell ringing find they are addicted to it, and end up spending almost every night out at different churches. It is essential that you try to maintain ringing at least once a week. Once you can ring to a certain standard, you will be asked to join in ringing for Sunday services. Do I have to be strong? No! The way bells are hung in the tower reduces the need for ringers to be strong at all. Once the bell is moving it requires very little effort to keep it rotating. What about an age limit? There is no real limit to the age you can start bell ringing. There are bell ringers learning today who are as young as 8, or even older than 80! Bell ringers have one of the widest age ranges of any hobby. Bell ringing is one of the cheapest hobbies around. 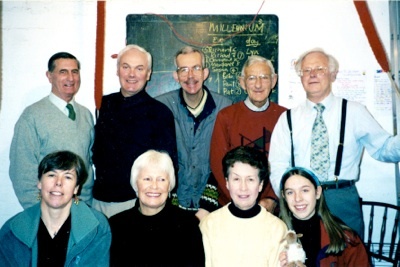 Once you are good enough, you will be asked to join the Lancashire Association of Change Ringers; an organisation to which all bell ringers throughout Lancashire belong, and with an annual subscription of just £5, is very good value. Once you have become a confident ringer, you will be able to ring for weddings (for which you get paid), funerals and other special occasions. 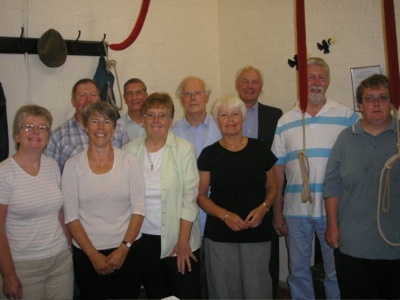 What other social aspects are there in bell ringing? Bell ringers are a very sociable crowd. We often visit pubs, and go on outings and visit different churches either locally or further a field. Coach and car outings are organised. 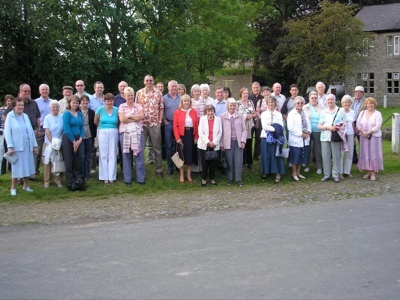 Once you are a member of the Lancashire Association of Change Ringers, you can attend local branch meetings. This is an opportunity to ring at other churches in the Fylde Branch. There is always the joy of visiting a new tower, as there are over 5000 places in England where you will be made most welcome to ring. 42 attended the trip of which 18 were ringers. Had a meal at The duke of York in Grindleton afterwards.